Healthcare networks, hospitals, and physician practices are looking for new and better ways to leverage web and mobile technology to find, attract, and retain high-value patients. Branded virtual assistants can help executives, IT professionals, and healthcare marketers improve their competitive position and increase revenues by responding to the increasing demand for a rich, interactive, and personalized user experience. Virtual assistants empower patients through the use of web and mobile based interactivity and tools to effectively accomplish online goals. A wide range of organizations are integrating intelligent virtual assistants as a core piece of technology to enhance the healthcare consumer experience, increase efficiencies, energize mobile engagement, and improve wellness participation rates. This guide reviews some market drivers which are spurring innovation in patient engagement and wellness participation. 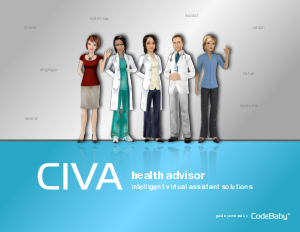 In addition, it overviews the main capabilities of the leading virtual assistant solution, CIVA health advisor.